"A team of new superheroes - under the mentorship of a talking cat"
While fretting about his missing sister, Cliff discovers that his cat, Edmund, is no ordinary cat, but a fully-sapient felid alien who uses his technology to turn Cliff's enthusiasm for maps into a superpower -- and making Cliff the first member of what will eventually become an awesome team of superheroes. The first (and current) story in this series "Hall of the Cyborg King", was initially conceived by the author as a short-story that was released in two parts on a discussion board --- but now, the same author is expanding that story to the length of a novel -- and after doing so, will then follow it up with more adventures and more superheroes joining the team. Cannonville Heroes has not been tagged yet. Help others find Cannonville Heroes by tagging it! 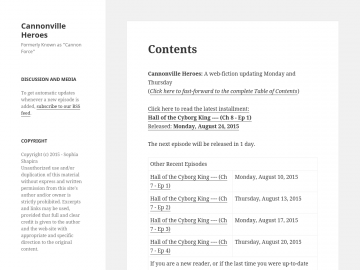 Cannonville Heroes has not been reviewed yet. Cannonville Heroes has not been recommended yet.